Easter weekend was upon us, and after a last minute change of plans I was faced with choosing a new venue to take my father-in-law (Jeff) fishing. I debated on whether to go back to the Viaduct, I know the place was absolutely stuffed full of fish, but I was also torn on choosing somewhere new. A few Somerset based anglers had mentioned Higher Kingscombe Farm as an alternative venue and Google mapping the venue showed an entire complex of lakes. Some further investigation on their website explained that there were some truly huge fish (30lbs+) in the bottom ponds. I wouldn’t be targeting those, but I did like the choice of the other 5 lakes. So with my confidence still soaring from my previous trips to the Viaduct and Revels, I decided on the new venue and Jeff and I set out for an afternoon of fishing action! My sodden peg for the day! As you can remember, the weather on Easter Sunday wasn’t great, and we arrived mid drizzle shower. I threw on my water proofs, had a quick walk about my chosen lake (middle group of lakes on the far right hand side, when looking from above) before returning to the car to grab my gear and get cracking. The rain at this point couldn’t decide what it was doing, and the wind, although not particularly strong was providing the occasional cold gust. The lakes are tiered as the valley descends, and I found after setting myself up I was a good 3 feet above the water, whereas the opposite banking was only inches above the water level. I had managed to steal the corner swim. I had a tree to my left at 7 meters and another feature diagonally left which I could reach with a feeder. Also a small margin swim to my right and the obvious open water swims out in front. I plumbed the depth and aside from an obvious shelf about 18 inches away from the margin, the lake was a uniform depth of 3 ½ft. Jeff setting up one of his rigs! The slight chop on the water and overcast sky meant visibility (for red tipped floats) may be an issue, especially as I didn’t have many rigs tied with Yellow tipped floats (Must buy more floats!). After a good few pouchfuls of maggots and pellets, I shipped out with double red and started waiting. Jeff was already fishing but so far it was all quiet. The rain was falling heavily now (which added to the visibility issues) and as I waited it was an incredibly unusual experience, not to have a bite within seconds – Especially using maggots. To make matters worse fish were occasionally topping and I assumed they were eating the emerging midges that were beginning to buzz annoyingly around my face. Seeing the surfacing fish I shallowed up to 8 inches and began firing micro pellets and the occasional maggot over the float, finally the float slipped under and I was into a fish. A Rudd of a few ounces. The fish were in great condition. Jeff had already hooked up several times, but unfortunately his fish had dropped off before reaching the bank. I was in the lead (not that I’m competitive…) I shipped out again, and employing the same tactics I was soon into another Rudd. Jeff was in again, and this time be brought to the bank a nice Roach, this was quickly followed by a Rudd and a few Perch. Jeff had been dutifully feeding his open water swim, and fishing over depth was definitely paying off. After 3 fish I decided to neglect my open water swim and come in close in search of a lump. The tree to my left offered some great cover and I shipped out getting as close as a dared to the branches. The red tip of the float was difficult to see with the chop of the water, and after 20 minutes wait and 2 pellet changes I finally got a bite, I missed it and swore… Loudly. Jeff was still catching (and sometimes missing) his silver fish, but he was getting bites a lot more frequently than I was. Another 30 minutes passed and I missed 2 more bites. This was not going to be my day. I fed my margin swim again and decided to leave it settle. Walking over to Jeff, it was clear that the pockets of my waterproof coat and salopettes were not up to the weather’s challenge. My wallet was soaking, and my phone was heading the same way. My feet, knees, crotch and lower back (where all the seams are) were all cold and damp making the slow trudge to Jeff’s peg an unpleasant one. I saw he was still fishing over depth, alternating between corn and maggots and it was paying off for him. I headed back to my box, and sat back down. I think the polite word for what I thought as I sat was “Yuck!” All the while Jeff was into something more substantial. His 8-10 elastic was getting tested. The fished turned and moments later the hooklength pulled, his call of “well that was exciting!” made me laugh. This was getting tough, and my mind turned towards my home, with heating a boiled kettle and dry, warm clothes…. I glanced down into my margin swim…JACKPOT! The next half an hour however passed in a blur, and I paid no attention to the rain, wind or cold. There was an enormous (clear double) Carp munching around in the silt 18 inches in front of my feet! My hands were very cold at this point, and hair rigging a 8mm pellet and fixing an invisi-stop was incredibly difficult. Still, I lowered my bait into fishes path and held on. If that worked it was going to go off like a train. The fish it seemed wasn’t interested in my pellets and kept narrowly missing my hookbait. Desperately trying to catch the beast I tried all my pellet sizes, meat and corn but nothing seemed to tempt it. After gorging for 20 minutes The fish lazily swam under the margin to my right then took a 90 degree turn and swam out into the middle of the lake. Bugger! It was now 4 o’clock and I had caught a small handful of fish for my efforts. 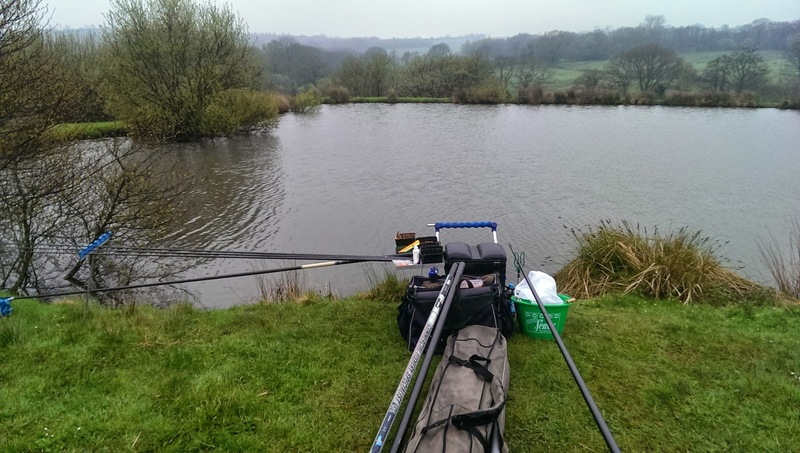 I decided to spend the remainder of the session after the smaller fish in the lake, swapping my heavy top kit (Solid 16) for my lighter kit (8). 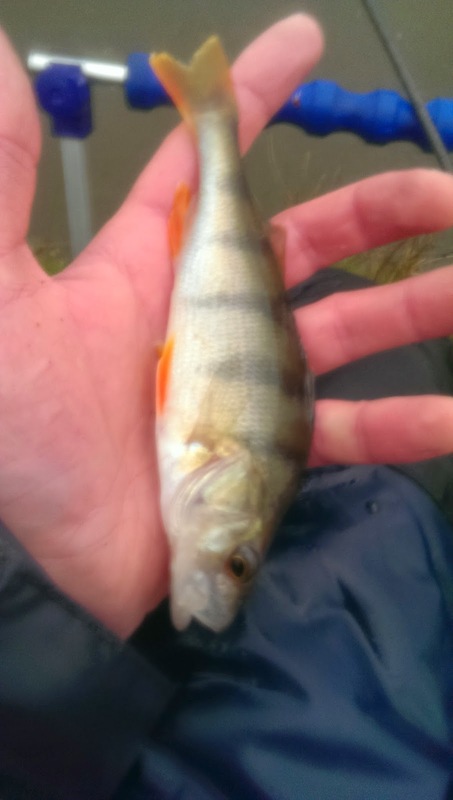 I shipped out my dead depth Roach rig with double red maggot and was fairly quickly rewarded with Perch. Phew! Maybe I could catch a few more before the end of the day. With my second attempt at shipping out , I was into another Roach, this one was only a few inches long. Still, I was catching fish. I switched to double caster thinking it may bring on a better stamp of fish. Despite the hammering rain this was my most positive bite of the day and the float disappeared from sight. I struck into the fish and instantly knew it was something bigger, a lot bigger. There was a lot of stretch in my new elastic and I raised the pole and slowly began shipping in, the fish was swimming around my swim in circles. It must have noticed it was hooked at about 6 meters. This fish wasn’t coming in, it dived off diagonally right. In seconds I was back at 9.5 meters trying to grab a nearby extension. I could feel my elastic just about bottoming out, and with one final surge my line gave. Float and all! What a pain. A disappointing end to a disappointing session. I took it as sign and began packing my sodden gear away, Jeff followed suit and before long we were in the car with the heater on full! Despite the awful conditions and getting out fished by Jeff I really liked High Kingscombe Farm and I will be returning there very shortly to try and make amends. 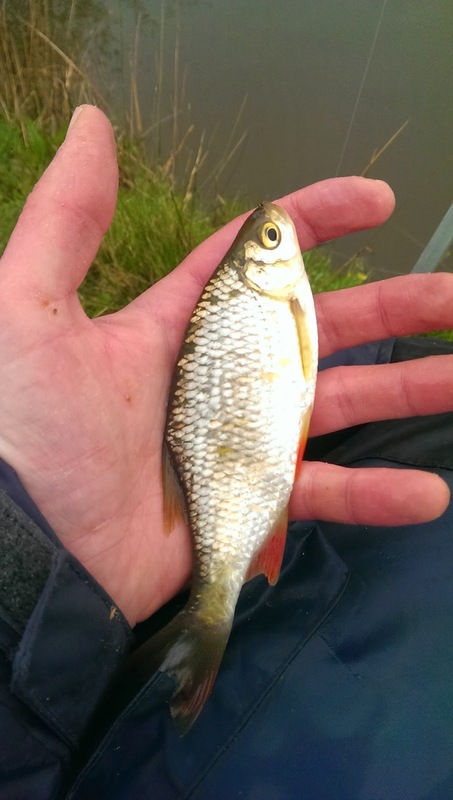 This fishery isn’t like the conventional commercial lakes stacked full of F1’s and millions of silver fish. 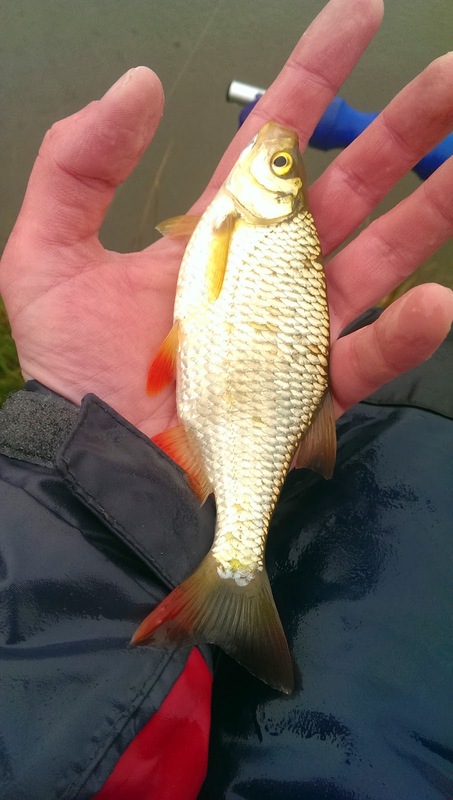 These are lakes with good populations of Roach, Rudd, Tench and Carp which you actually have to work to catch. The lakes seem to be tiered as the valley slopes down making disabled access possible for the lakes nearest the car parks. There are no defined pegs to speak of (except on the top Dorchester AA lake) but it is very comfortable fishing, and with 2 rods allowed for the price of £7 it would definitely be worth chucking a sleeper rod down in the margins for something special. Fishability – ***1/2 – Looked good, and on this occasion I’ll blame the weather for my awful performance. Accessability – ***1/2 (2 Car parks, and fairly easy to find, just off the A356 after those mental abseiling pylons. Value For Money – £7 – In an honesty box in the shed on the left as you enter. 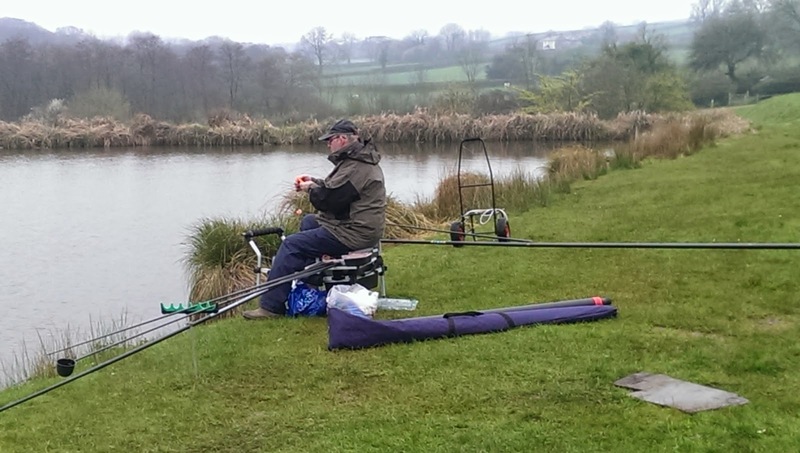 Disability Access – The first car park has access straight on to the top lake, so disabled Dorchester anglers only have to navigate a small amount a grass before reaching solid pegs. The lower car park has access to some of the middle level lakes but without assistance getting to the water side may prove difficult (especially with wet grass). Shame you didn't report on your previous trip on the DDAS lake.